By: Square Enix Co., Ltd.
•	Players can create their own heroes, deciding how they would like their face, hair and clothing to look. As the story unfolds, players become stronger, smarter and more powerful, and can create custom companions to join their group as well. •	Players will have fun discovering more than 900 pieces of clothing, armor, weapons and other items that will provide them with a unique appearance and special abilities. Even occupations can be customized and changed at any time. Players can take on one of a dozen different jobs with varying strengths, weaknesses, spells and skills. •	Fast-paced battles unfold as players decide what to do and then view cinematic action scenes. This format rewards careful thinking and strategy over quick reflexes. The more foes players defeat, the stronger their characters become. •	Special multiplayer modes let players share their adventure with others, allowing up to four players to team up via a local wireless connection and experience the fun of tackling challenging monsters and dungeons cooperatively with their own characters. Players can even leave the game active in their backpacks, pockets or purses and still interact with other players via an interactive “Tag Mode.” Fun information about players’ characters can be wirelessly transmitted to others. •	Treasure maps allow players to find otherwise inaccessible special dungeons called grottoes, which can contain rare items or enemies. In Tag mode, treasure maps and customized greetings can be exchanged automatically by players who come within range of one another. •	Players with wireless broadband Internet access can visit an online shop to find new items or download additional quests. The selection of items changes daily. Some downloadable quests will continue the main storyline of the game, while others offer standalone missions or quests themed to a particular time of year. •	Talking with different characters will unfold the story and point players toward their next mission. All quests come with a reward, which might be anything from a rare item to a new, unlocked occupation. Description: For decades, Samus Aran has been known as one of the first female protagonists in video games, and one of the most enigmatic. Having traded her haunted past for the solitary life of a bounty hunter, Samus™ finally tells her own tale in this revealing, personal story of her failings, her flaws and ultimately her motivation. Metroid: Other M is an unprecedented collaboration that blends the slick, action-packed production of the world-renowned Team Ninja development team with the game design talents of the creators of the original Metroid. Metroid: Other M is a dramatic new direction for a legendary franchise and a bold new blend between cinematics, storytelling and the best in interactive entertainment. Verdict: Dragon Quest IX: Sentinels of the Starry Skies is another sequel the second best selling franchise offered by Square Enix. Just like previous versions of Dragon Quest games this one is sure to please fans new and old alike. The game play is genetically consistent with traditional turn based RPGs which are simple to learn and only really challenging for boss battles. The game allows the user to control each part members moves or giving the AI control. It’s built for all levels to take part in this journey of exploring lands, dungeons, and battling their way through increasing more challenging enemies. What’s unique to Dragon Quest IX: Sentinels of the Starry is the multiplayer functionality. A host can open a portal to their game to allow up to three friends join him in and out at any time. This gives them control of their personal character to play for that session. Just be forewarned hopping onto a friend’s session does not help progress the game for the visiting party members. It does reward their assistance with experience points and the items they collect become available in their quest. Graphically the game looks good with traditional anime wit and charm. The animations are consistent with most traditional RPGs. It sometime felt too traditional and repetitive but somehow kept me engaging. One of the nice aspects of this game was the customization to the characters to help update with the visual game play. The game allows the user to control a vast amount of the cosmetics, weapons, and armor for their avatars. It’s a nice feature that allows for interesting combinations. It also helps with the multiplayer function to keep focused on the your customized avatar. By: Nd CUBE CO., Ltd.
•	Animal Tracker: Players place four Wii Remote™ controllers (sold separately) on a table. Wii Party will then give the players an animal noise to listen for. Each Wii Remote will emit a different animal noise and the first player to grab the Wii Remote making the correct sound wins. This game can also be played with two people. •	Hide 'n' Hunt: One player asks the other players to leave the room and then hides Wii Remote controllers around the living room. When the other players return, they have a few seconds to find the hidden controllers hidden around the room. This game is also playable with just one Wii remote controller. *For multiplayer modes, additional Wii Remote controllers are required and are sold separately. Description: The Whole Family Stars in its Own Electronic Board Game. Wii Party is a fun, multiplayer* experience for everyone in the family that features your Mii™ characters in the midst of the action. Now Nintendo brings the fun from the TV and into the living room with Wii Party, a game that changes the way people interact with other players to get the results they want in the game. Featuring 13 different party game modes and over 80 minigames, Wii Party can be enjoyed by everyone in the family, regardless of age. Verdict: Here we go again with another party game. That was my first thought when hearing about this title’s release. Since Nintendo had a successful franchise with the Mario Party series which spawned several sequels over the run of the N64, Game boy Advance and Game Cube it comes as no surprise that it would develop another of its own party type games for the Wii. Instead of using Mario and the rest of the iconic Nintendo family, Nintendo invited the Miis this time to the party and built the games around the technology embedded in the Wii Remotes. This is where the game really differentiates itself from the previous mentioned series. I really enjoyed the experiences with games like a hot potato type game where players are required to pass around a Wii Remote (the hot potato) and press a series of buttons to prevent a bomb from going off. Move too quickly and you’ll set off the bomb. Another one I experienced required each player to balance a series of packages using the remote. Tilt too far in one particular direction and they would all fall. Games like these, which took advantage of the technology like the speakers and the accelerometer, were more engaging from my experience. With 13 game modes and over 80 minigames there is lots of variety to choose from. Some games work better than others depending on the number of players participating and audience level. That’s expected with these party type minigames and may leave some people unsatisfied. 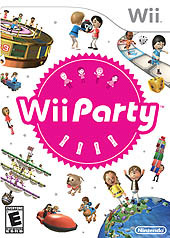 In Wii Party Nintendo has a done a good job of balancing the games out so that it appeals to gamers of all ages. Overall it’s one of the better party type games so far released for the Nintendo Wii and can be a lot of fun with a group of friends and/or family.